Wheel Deal features three thrilling game stations, each with its own spinning wheel and unique jackpot values. 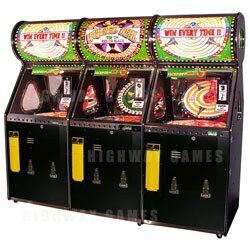 Players get to test their skills by dropping either coins or tokens down a brightly-colored ramp in an attempt to land in the specially marked WIN ZONES. There's also an exciting 4-digit Progressive Jackpot at each of the stations, which is totally operator adjustable.